I came across the below makeshift memorial in front of an Apple store in my neighborhood. Steve Jobs had such an influence on so many people’s lives: the way people look at technology, listen to music, communicate with others, watch movies, etc. I guess that’s why so many feel like they knew him personally. It’s ironic, given that he was such an elusive man. I don’t know of any other CEO or industry leader who’s death rocked the world the way Jobs did. I wonder if Henry Ford had the same impact on his generation. But he had an eponymous brand that reminded people of who he was. Jobs didn’t have the benefit of a namesake brand; and yet, you can’t picture Apple without Jobs. That got me wondering if my little nieces and nephews would fully appreciate the impact Jobs had on the world through his vision and innovation. One of my nephews was 2 when the iPad first launched. And he doesn’t know a world without an iPad, iPhone, or an iPod. But would he understand Jobs’ impact? I drive without once thinking about the impact Ford had on my way of life nor do I ever think about Edison when I turn on the lights; because it’s just the way it’s always been. I wonder if it would be the same for my little nephew. I have to tell you a cute story about my little nephew. He was playing Angry Birds and watching movies on his iPad way before he could articulate all of his intentions (or completely potty-trained for that matter!). So when he decided to play on his daddy’s computer, he started moving his fingers across the laptop screen, assuming it was a touchscreen. After many failed attempts at getting the computer to respond, he declared the laptop broken. Steve Jobs created (or at least it was his vision) a computer so intuitive that a 2-year-old could use it. Literally! 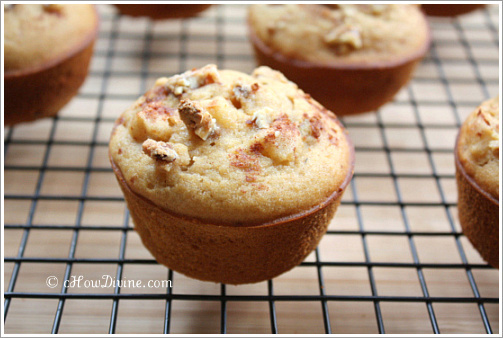 So in Steve Jobs’ honor, I decided to make some Apple muffins. As previously stated, I don’t usually have the patience for baking. But if anyone deserves my patience and discipline (excepting my mom & husband, of course), it would be Steve Jobs; he did make life so much easier and convenient for so many people. Preheat oven to 400 degrees. Grease a muffin pan with an oiled brush or a canola oil cooking spray. 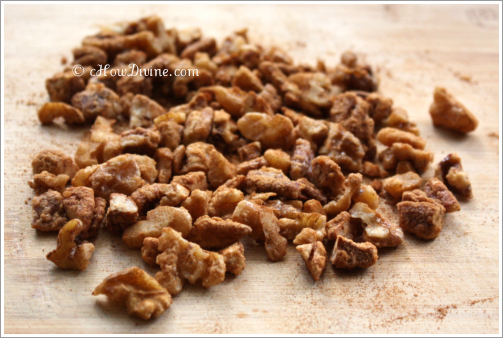 In a small bowl, dredge the candied nuts with 1/2 tsp of cinnamon. In a large bowl, mix (using a whisk) together all dry ingredients: brown rice flour, millet flour, tapioca flour/starch, baking powder, teaspoon salt, and 1/2 tsp ground cinnamon. In a smaller bowl, whisk together brown sugar, canola oil, and eggs. Once they are well combined, add agave, applesauce, and vanilla extract. Whisk well. Add the whisked liquid ingredients to the dry ingredients. Mix to combine. 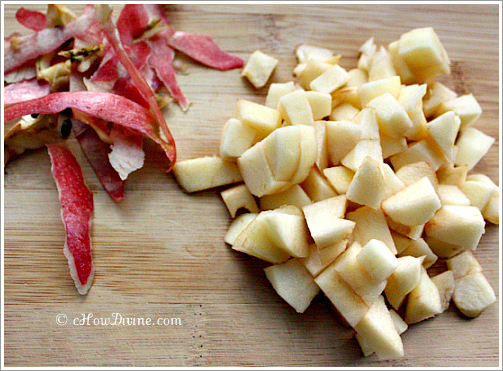 Add the chopped apples and mix gently. Add 1/3 cup of the candied nuts and mix gently. 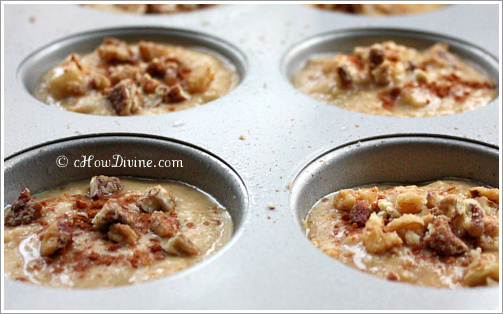 Pour the mixture into the greased muffin pan. Sprinkle with remaining 2 TB of the chopped candied nuts. Let the muffins rest for a few minutes in the pan. 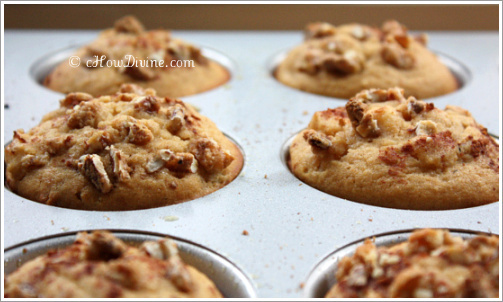 After about 5-10 minutes, remove the muffins from the pan and let them cool completely on a wire rack. 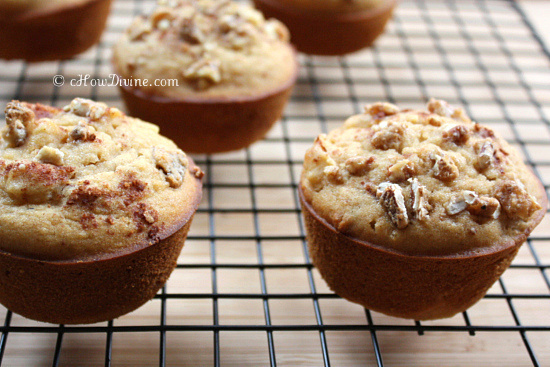 These muffins are so moist and delicious. It’s got me thinking twice about my aversion to baking! * It’s a very simple recipe. So don’t skip the candied nuts. It makes a difference in texture and taste. ** You shouldn’t need additional liquid. The batter should be plenty moist. But if feel that you need it, add little at a time. Remember, apple pieces also give out moisture once introduced to heat. 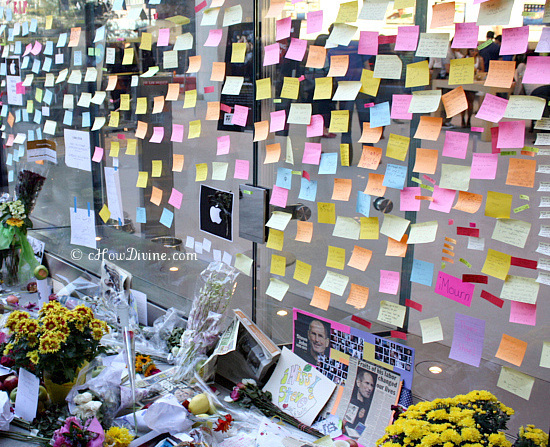 It is so wonderful of you to bake this Apple Muffin inconjunction with Apple in remembrance of Steve Jobs. He will be remembered forever of his contribution. He will be remembered as one of the greatest – if not the greatest – CEO or industry leader of all time. He will be missed indeed. 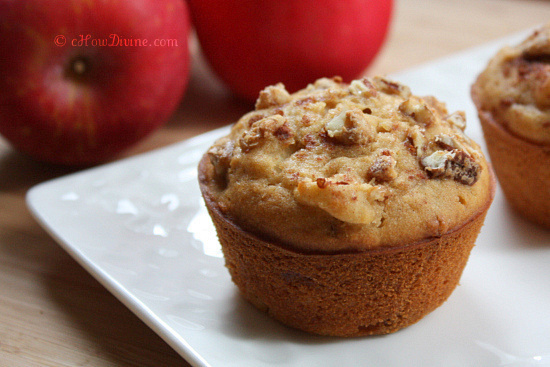 I can almost smell the yummy muffins… love apples! I love the aroma of muffins wafting through my apartment. I wish I can bottle it!